The best thing? a step by step tutorial on how to make it. Click here. I think I already posted photos, although this time I got proper permission to post them! 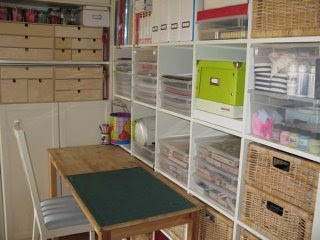 Anyway, check this link out for the Open Studio with photos of many studios and storage ideas. 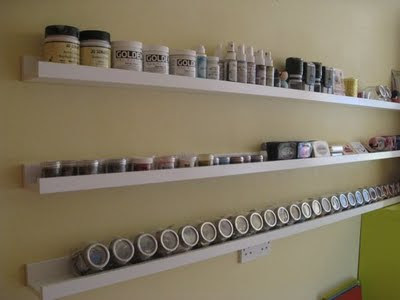 Uk crafters have been dreaming about a Uk company to save some postage that makes racks for inks and inkpads. Now there is a company that makes them here and they have all sorts of racks solutions. Wow! 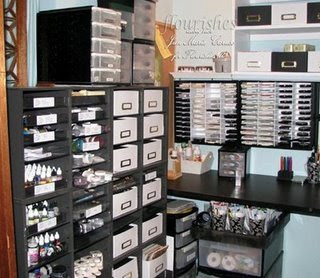 Love the all in brown coordinating drawers. Love it! Click here for more photos and explanation. 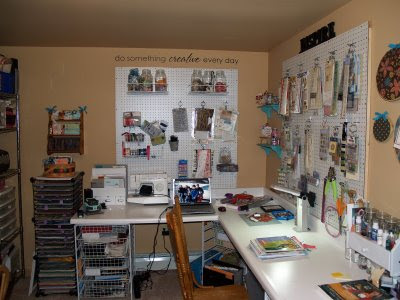 Click here to check out Gretchen's studio. just lovely! 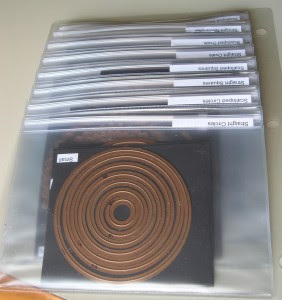 Click here to read Janine's great idea on how she stores her Nestabilities and more types of dies . And here for the main page of her blog. Click here to go her blog to see Shari's amazing work. 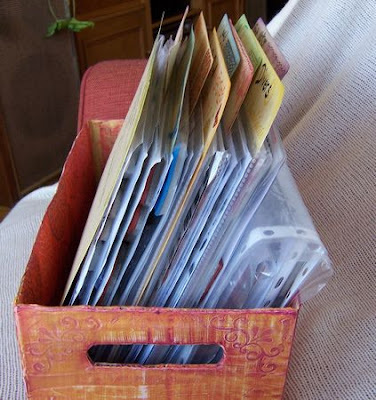 Click here to read janine's great idea on how she stores her JustRite stamps. You can see more and read more here. Check it out in Mandy's blog here. "This is a shoe holder that fits over the door. It has numerous silver rods on it. I looped my ribbon through and just let it hang down. Quick and easy to find.........just hold up the length you need and cut it off." 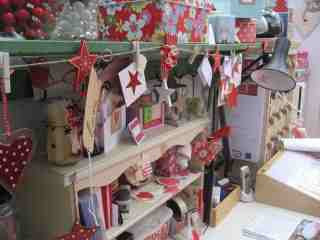 I really like the idea of having clear stamps in a box standing upright, so much I like it that I have adopted the idea! 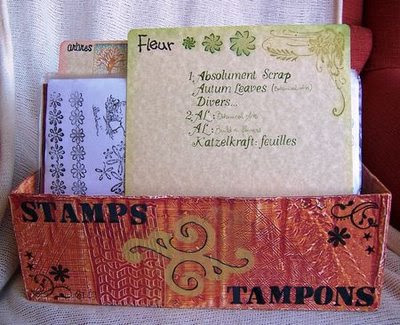 Click here for the finished project post and here for the main page of Marie-Helene's blog. 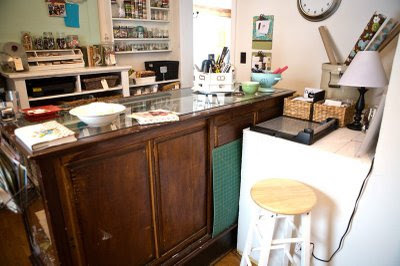 Check this post out! lovely ideas. 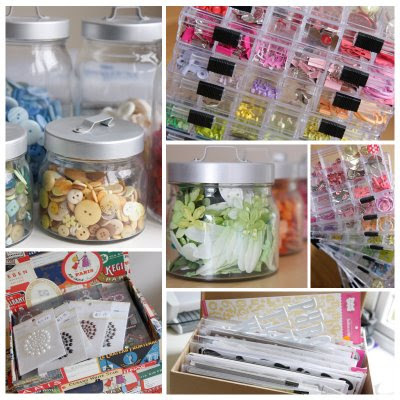 I received a couple of weeks ago this email of a reader requesting for ideas on how to store the crafts things we make, such as cards and mini albums etc. And today Emma sent me an email with this. Enjoy!
" 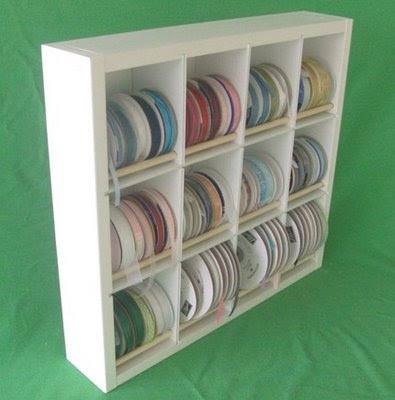 This is a card organiser I recently made, although I take no credit for the original concept, the work is all mine. I had the empty storage box from an empty display box from Asda. 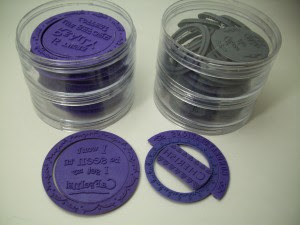 Luckily for me the outer shell was already turquoise and so I lined it with some of the free white card you get at the back of Stampin Up designer paper packs and covered it in lovely paper, ribbons and stamped and punched some embellishments." You can check her blog here. Click here for the main page of her blog. Loads of ideas packed it. Have a proper look here. 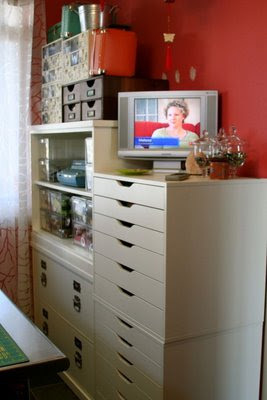 Joan has great storage ideas as the one above, using over the door storage, and the one bellow using a DVD rack for inkpads. 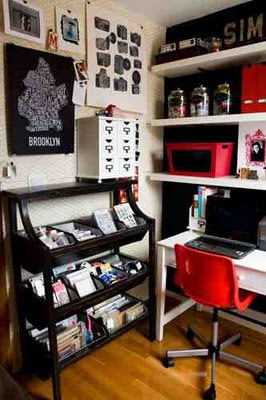 Click here for loads of photos fill with storage ideas! Honestly, one of my favorite things in craft storage are magnets. They really are magical when it comes to make the most of what storage we have. 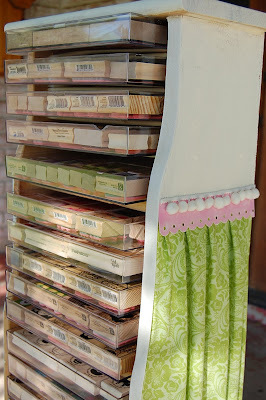 like this card swatches are attach to the shelf by a strong magnet to the metal bracket. For the full picture click here, which is the main page of my personal blog. One of the loveliest I have seen lately. 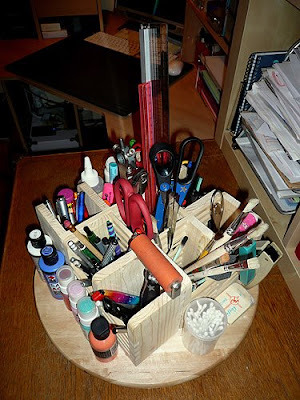 Click here for loads more photos and ideas. 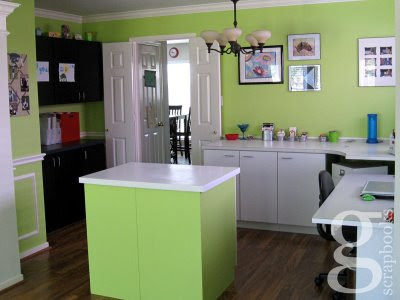 Click here for more photos. It is wort it! You can find more photos and explanation here. 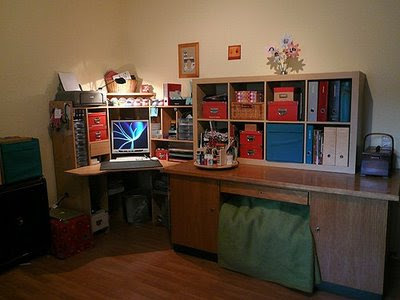 Brilliant, if you have the space! Click here for more info and here for the main page of Rebecca's blog. 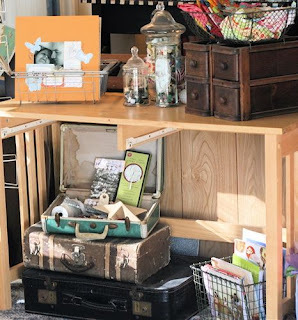 Megan Hoepner has over at Creating Keepsakes blog an entry on how she stores brads. Here it is. You can read all the explanation here. You can check more photos here. Its dedicated to Organization, you can get it here. I have just got it, so I can not make a judgment just yet, but I am sure that will contain some good ideas. Fingers crossed! 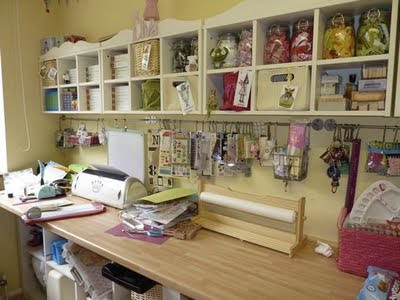 You can find more photos and explanation of Amandine's studio here. 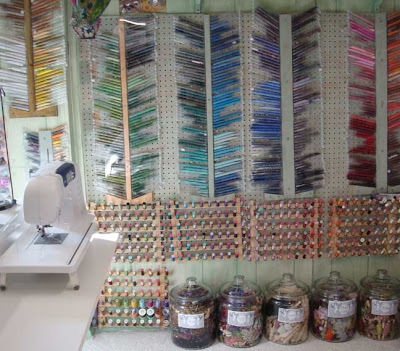 It is in French, but I think craftystorage followers are pretty clever and can figure out what she says! 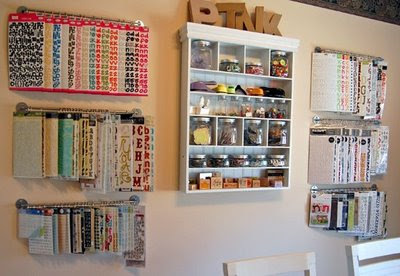 I just found this at this lovely Etsy shop called Organize More. Just perfect. 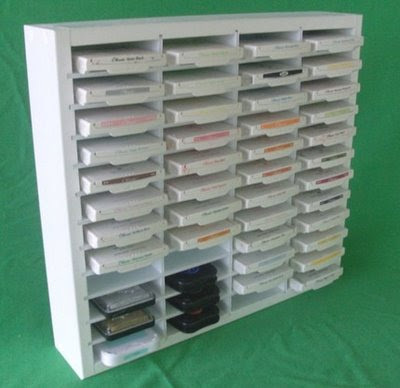 They also do storage for Cricut cartridges, dies and stamps. 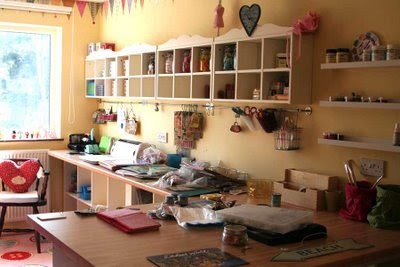 Lovely studio. Check it out here. I am a crazy quilter who dabbles in mixed media art as well . 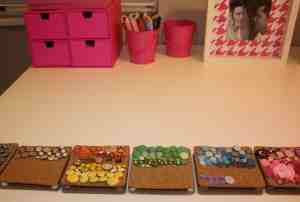 I have a bead storage system which my husband dreamed up for my studio walls. 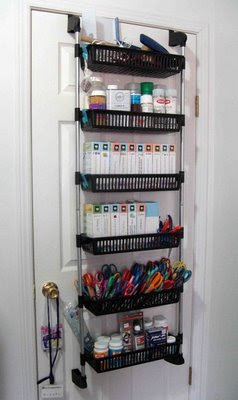 This keeps my seed beads against the wall and in sight for quick gathering for projects. He used Plexiglas, wood, and screws to contain my 6" bead tubes against the wall. 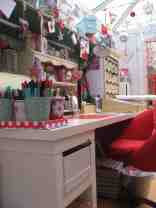 Click here for loads of photos and ideas. 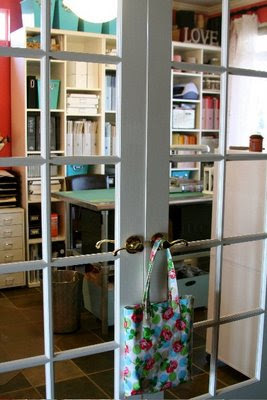 Paula Wessels studio is packed with storage ideas. Have a proper look here and here. Or click here for the flickr photos, or here just to check out the main page of Paula's blog. 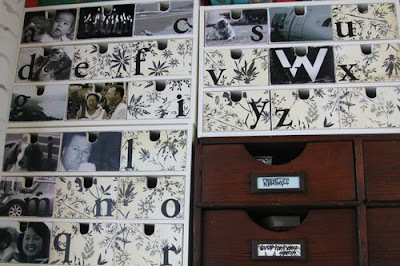 I would like to show the idea of storing alphabet stuff (stamps and chipboard) by letter in each drawer . Check it out here! It is worth a closer look. 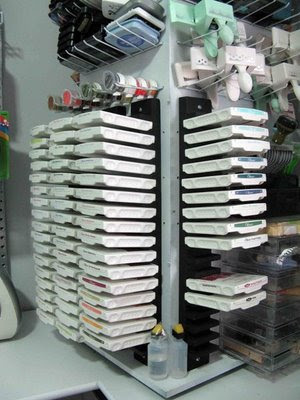 Nowadays is frequent to have several types of rubber stamps, and to store them all in a place is quite difficult. 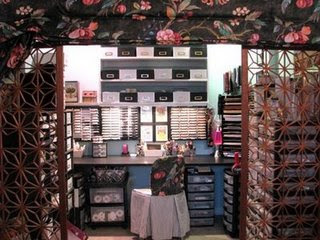 That is why i love Dawns stamping unit, there is a place and a way to organize every single type of stamps. Click here to see more photos and detail explanation. And here for the main page of her blog. As recently found in a CK article, Candice studio is small but beautifully done in my three favoriet colours, Black, White and Red. Click here for loads of photos and here for the main page of her blog. 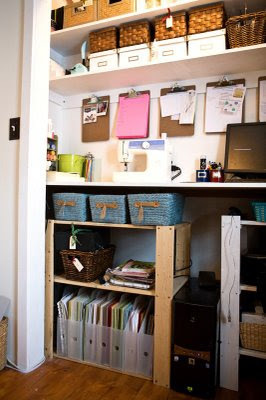 Looking for ideas for small and practical studios? This one fits the bill. Enfys studio is in a cupboard, but does work! And check how the glitterglues are stored. Just click here to see all the images and here to go to the main page of her blog. 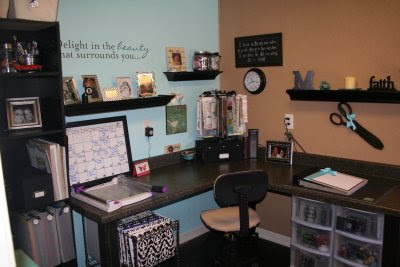 It is worth the look, loads of simple and stylish ideas!